The star-eating at exposures of 4 seconds and longer is fixed. The star-eating is now a function of which raw chanel you look at. I loaded the firmware into an a7RII yesterday. I will spare you my usual rant about the terrible Sony firmware updating process, but that doesn’t mean that I’ve made my peace with it. I made a series of dark-field exposures with shutter speeds from 1/1000 to 30 seconds, and added a 40-second bulb exposure. 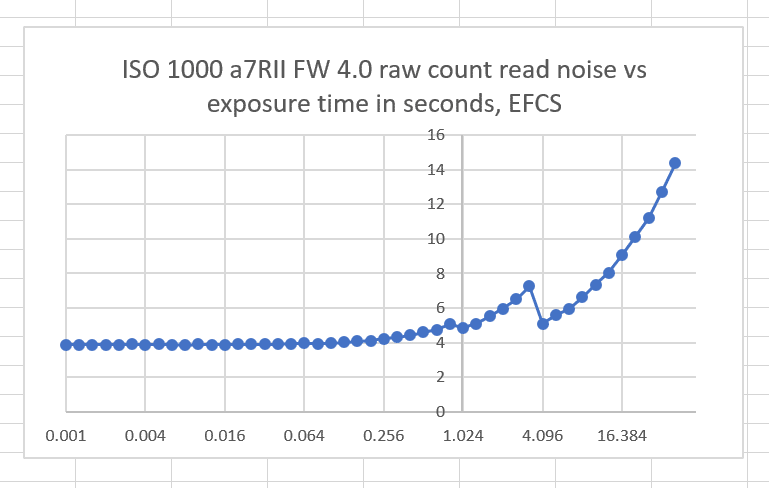 Shutter was set to EFCS, single shot, LENR off. The raw file format was uncompressed. I brought the raw files into RawDigger and looked at the statistics of each raw plane in a central square 400×400 pixels in extent — that’s 200×200 in each raw plane. Except for that little glitch at the transition from 0.8 to 1 second, it looks like FW version 3.30. This is not encouraging. 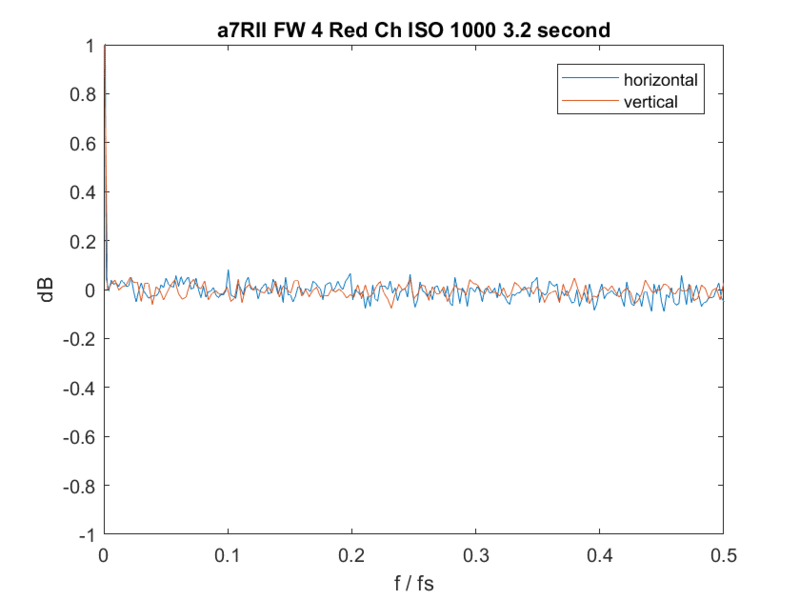 The red channel looks flat indicating that there is no low-pass star-eating filtering taking place. The first green channel — the one in the same rows as the red one, also looks fine. The green channel in the rows with the blue pixels looks just like this, so I’m not going to show it to you. 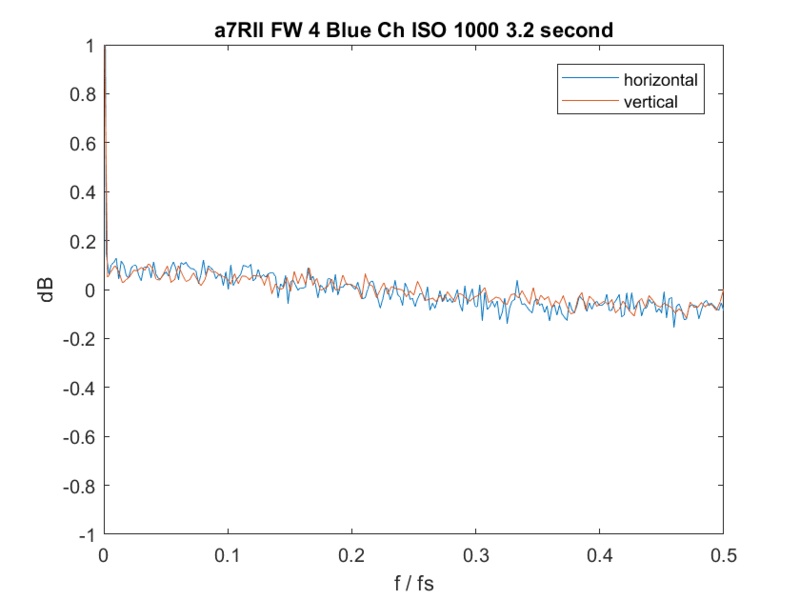 The blue channel has a little bit of low-pass filtering. I didn’t look at this with FW 3.30. I think it is probably the camera’s inteerpolating over the phase-detect pixels that are in the blue channel. Yes, indeed. fairly heavy low-pas filtering. This looks the same as with FE 3.30. The first green channel looks similar. The blue channel looks different. The filtering is slightly stronger and it’s anisotropic. Is this just the same PDAF pixel interpolation, or is there something else going on? In any event, the differences don’t look they are significant. You don’t mention it in the article, have you enabled the new feature LENR off in the menus? LENR was off. That was an option in the old menus, too. I’m not sure what new feature you’re referring to. Could that be that kink at 1 second? did you see any traces on Fancy Bear in metadata ? I was one of those who suggested that Sony has changed the behaviour in the green channel in FW version 4.00. I’m still 100% certain of this. However, it’s most interesting that it doesn’t show up in your frequency plots. I’ll do some further analysis and get back to you – I think there may be an explanation. In which green channel did you see the change? Both – I believe the 2 green channels are now interacting with each other. 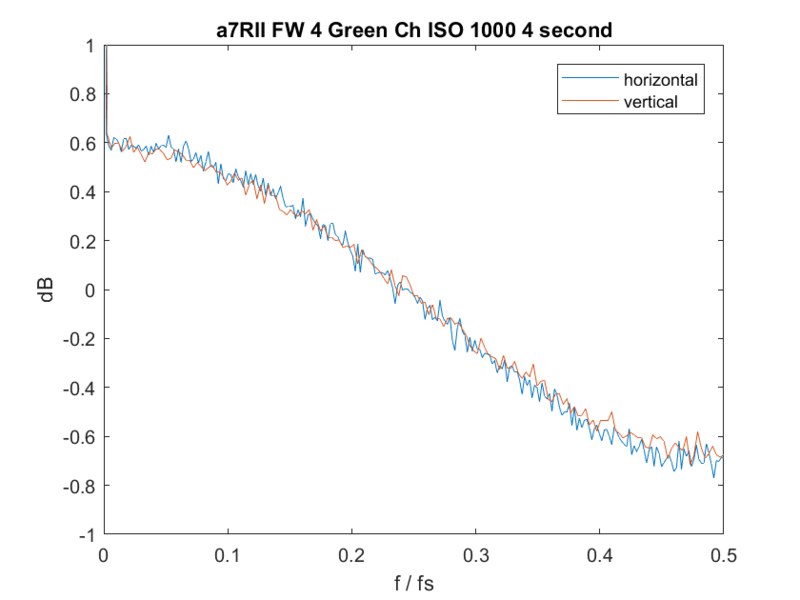 Previously each green channel was filtered independently. So it doesn’t look like a high covariance then? To be honest, I don’t know what to expect for the covariance. 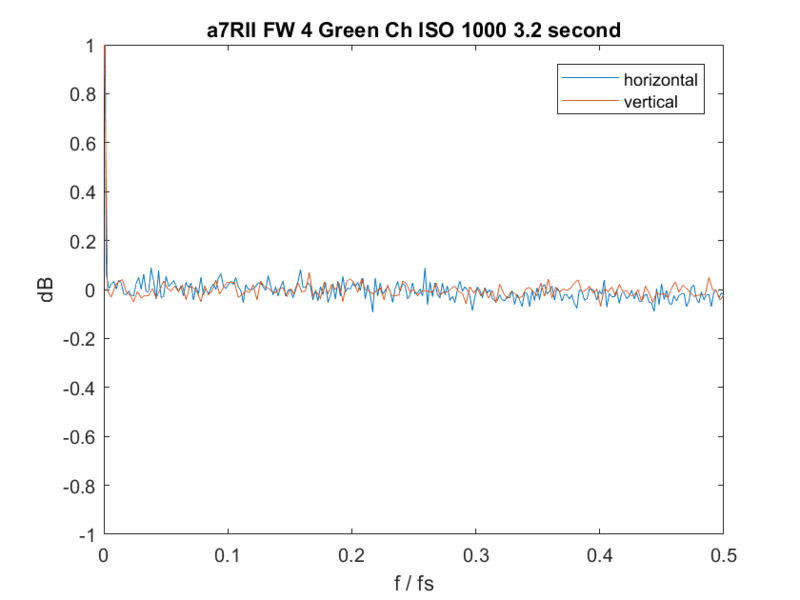 I’ve just run a test of what I believe FW 3.30 and FW 4.00 are doing with the green channel. Interestingly, the power spectrum is more or less identical in each case. In other words, the power spectrum does not appear to be a good discriminator between the old and new algorithm. I’ll write up the results on the DPReview forum. Off topic. Jim: Have you noticed any downsides to using the a7rii’s IBIS feature while handheld (other than maybe draining the battery faster, which I don’t care about)? Is there a hit to IQ? Thanks! If you’re careful about the way you shoot, it’s a help. Don’t use it at faster than 1/(10*FL). Don’t use it on a tripod. Give the camera time to settle; don’t just stab the release. Thank you for your work and your blog. I’m not sure I understand your sentence about IBIS: “Don’t use it at faster than 1/(10*FL).”. 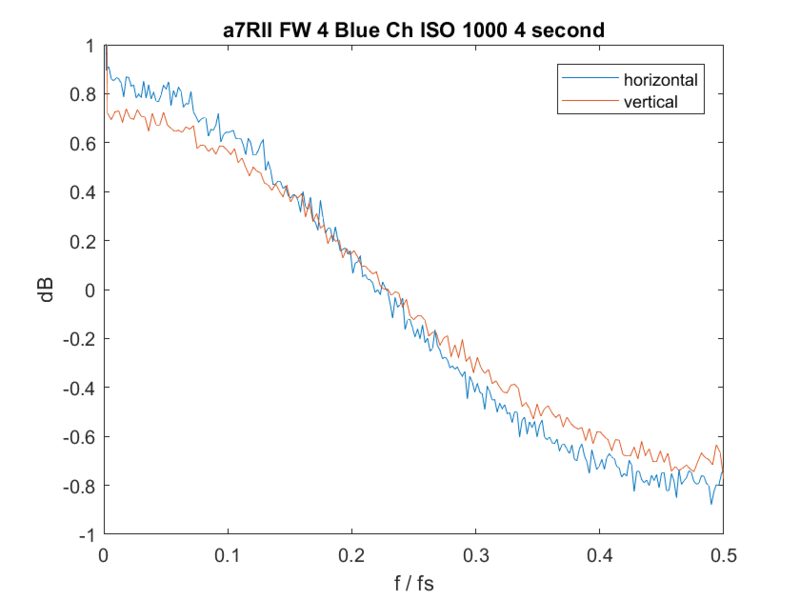 – don’t use speeds SLOWER than 1/(10*Focal Length), handheld and with IBIS, because IBIS is not efficient enough ? 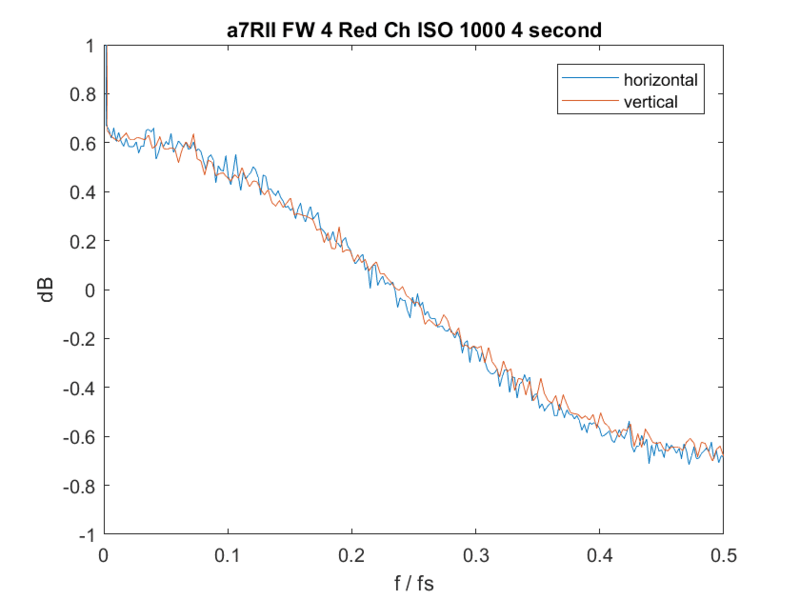 – switch off IBIS if you take picture faster than 1/(10*Focal Length) ? How about an example. Let’s say you have a 100mm lens. I’m saying turn off IBIS at shutter speeds above 1/1000 second. You don’t need it there, and why take the chance that it will screw up the shot if you don’t give it time to settle? If turning off IBIS there seems like too much trouble, you can ignore this advice and you’ll nearly always suffer no penalty. Don’t we refer to 1/10 shutter speed as “above” 1/1000 shutter speed, since 0.1 > 0.001? Maybe that is where the other poster’s confusion came from. That makes a certain kind of sense, but it is not the convention among photographers that I know. 1/1000 is a faster, or higher shutter speed than 1/10. That’s because we’re talking about “speed” and it makes sense for higher speed to mean shorter exposures. If we were talking about “shutter duration” then it would be the other way around. Do you know if the star eater issue effects the Sony a99ii camera? I would really like to see a comparison using higher ISO to see how much star eating effects is visible. I typically shoot at 12800 for 15 to 20 seconds at f2.2 or 2.8. Has anyone looked at the effect with these exposure times & higher ISO settings? Which version of RawDigger is required to perform this analysis? Any version of RawDigger will export the individual raw planes as TIFFs. No version will perform the spatial frequency analyses. For that I wrote Matlab code.